One cannot accuse Ken Glazer and Robert Morgan of giving up when the chips are down. It would be a big enough feat to transform a vacant, aging, historic structure in the middle of downtown, which is what Morgan Management LLC and Buckingham Properties LLC were proposing with Tower280 at Midtown, a $59 million mixed-use project on the site of the former Midtown Plaza. Months after the project kickoff, however, its future became uncertain when tragedy struck. Laurence Glazer, Buckingham’s CEO and managing partner, and his wife, Jane, were killed on Sept. 5, 2014, when the private plane they were traveling in to Naples, Fla., crashed off the coast of Jamaica. Morgan, who was Glazer’s longtime friend, and Glazer’s son, Ken, who took the helm at Buckingham after his father’s death, knew there was no option other than finishing the massive project downtown. “We both agreed this was not going to not happen,” Ken Glazer said. Glazer and Morgan sat down with the Rochester Business Journal recently to talk about the challenges of completing the Tower280 project, their thoughts on the finished building and how it can serve as a catalyst for further downtown development. ROCHESTER BUSINESS JOURNAL: What are your thoughts on the finished project? ROBERT MORGAN: I think the building came out great. It’s a real iconic building. It was the first big project (for us) in downtown Rochester. It turned out to be a fantastic property with parking underneath, which is a big factor. You pull into the parking garage and you just come in the elevator right up to your apartment. There’s nothing like that in the city. KEN GLAZER: This building is turning out to be sort of the perfect storm as far as the parking, the amenities, the views, the feel. I think there’s a sort of an aura that makes it feel like this is a new building in a new Rochester, and it’s different than just changing out the windows and painting the brick. This is really a true take-it-down-to-nothing and rebuild it and make it something different, and what’s been created there, I couldn’t be happier. Architecturally speaking, I’m certainly very pleased. 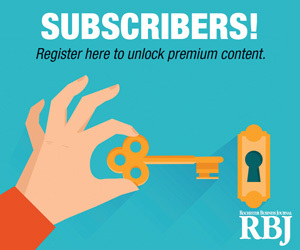 RBJ: What does completing this building mean to you and your business? MORGAN: One less project (laughs). We have a big commitment to the city of Rochester and to financial institutions and to get this completed the way it turned out is a big accomplishment for Buckingham and Morgan. GLAZER: I look at it as it needed to be completed for my father’s legacy. Bob started it and he was passionate, he believed in it. To see it not come to fruition would have been a disappointment for me. We all came together with the city to see Larry’s sort of swan song completed, because you knew if he were here it certainly would have been completed. MORGAN: We had a plaque ceremony (at the start of the project in May 2014). It was when we had the groundbreaking and the mayor and everyone was here. GLAZER: It took place shortly before the accident. My dad was there, looking up (at the property), and everything just seemed very far away. RBJ: I wonder what Larry would think of the building and property now. GLAZER: He’d be floored. We were steadily getting into nicer and nicer properties, and he really hit his (stride) when he got Legacy Tower, which was a thrill, but that was the property that was sort of bought as is. This one was really created through hard work and with a lot of different hands. I can’t imagine any more parties being involved, and to have it turn out on time, to have it relatively full; the reviews have been pretty good, I think. RBJ: What were the biggest challenges in getting this project completed? GLAZER: We didn’t have financing (for the project) at the time of the accident and it took us three to four months (to secure it). Everybody believed in Bob and Larry and when you take Larry out, there’s only Bob—and then the rest was Buckingham and (the question was) were they a viable co-signer, who’s guaranteeing it. There was a lot of legal stuff; the deal wasn’t done by any means. MORGAN: We were three weeks away from getting financing and then this tragedy happened and then the whole thing got pushed back. GLAZER: Everyone took a step back and said, not so fast, let’s see if this is really what we want to do. Aside from that, with the design itself, we found a lot of nuances that we weren’t expecting. For instance, the power lines, you would think, are identical all the way up, but they’re not—they’re a few inches off. Not a lot, but three inches one floor to the next, so (Americans with Disabilities Act) requirements get shifted, locations get shifted. The architect originally dimensioned every third floor, thinking it was the same. Well, we quickly got in trouble and had to go back and measure every single floor. With the brick, we originally thought we were going to cover it, but we realized we needed to make some replacements and realized we do it now or wait until it hits someone, which we weren’t going to do. So we took it off, because the face of the brick was falling off and the mortar joints weren’t there. So at every corner we replaced the brick, which meant scaffolding that we didn’t plan on. So there were a lot of extra, unforeseen costs. RBJ: Bob, you have said you kept pushing along with the project after Larry’s death, but did you reach a time when you thought maybe this isn’t going to happen? MORGAN: No, I never stopped. I just kept going. Larry and myself gave out $6 million in contracts the week (of the accident) and I’m thinking after—we just gave out $6 million in contracts. We didn’t miss a beat, we kept going. This is what he would have wanted. I said somehow, someway we’re going to get this done. I met with the city the following week and I told them the same thing. We didn’t stop for one day, we just kept going. This is what (Larry) would have wanted. GLAZER: Bob, to his credit, believed in us. He said, do you want to stay in it, and we said yes. I knew if we said no he would have gone forward, and if we said yes, he would have gone forward. So while we’re dealing with all the tragedy, Bob kept it going so we could focus on it, and as it turned out we’ve been great partners. We have the same mentality. We’re going forward and there’s no looking back. It was too important for so many different reasons, aside from personal reasons. The city’s in this huge momentum swing and this was the catalyst. If this didn’t go, I don’t think Andy (Gallina, president of Gallina Development Corp.) would have bought the (Metropolitan); a lot of things were hinging on us showing the world this can work. Downtown is ready. MORGAN: We had to kick-start downtown Rochester. RBJ: What is your favorite part of the project? MORGAN: For me it’s the multifamily. I love what we’ve done with that. I love the design of the apartments; the one-story and two-story (units). Just the way they turned out is amazing. I like to do urban-type development, and this building couldn’t be any nicer. GLAZER: I agree it’s innovative, different. We knew this was going to be different because there’s no high-rise living at all, but we took it up another notch by creating something that the neighbors just can’t do. I like the third floor, the dog park, the outdoor eating area. It’s fabulous. Friday and Saturday nights, apparently, it’s pretty jamming. People are grilling out there, playing music and the dogs are playing in the park. So far, it’s being used quite a bit. It brings the tenants together. It’s nice walking around the city and seeing people walking dogs. RBJ: What impact do you think the building will have on downtown development? GLAZER: It’s hard to say because this is all we are concentrating on, but you know there’s development all over the place. No longer does the city give away a building for a dollar. There’s (requests for proposals) and interest in properties. Two years ago, Parcel 5, no one cared about. MORGAN: Now everyone’s chasing it. GLAZER: We have … real proposals (on Parcel 5) and we didn’t even do one. MORGAN: Our plate was kind of full (laughs). GLAZER: I like the green space but don’t think it should be entirely green space; it’s got to have a revenue. It needs to be four seasons. I don’t think a park is enough to take advantage of such well-positioned land. The city needs a gathering point; a place to eat lunch and with food trucks. Right now, Bergmann (Associates) and Pike (Cos. Ltd.) play whiffle ball once a week and we’re going to be getting in on that, too. Those are the kind of things people are using it for; organically that’s what’s being drawn there. And I hope the city watches how it’s being used by the people. They’re not saying we need a big high rise there, they’re saying we need a place to play ball, go to concerts. There’s an energy there. It’s nice (for tenants of Tower280) to look down and see some activity. We need some nightlife. MORGAN: They have some decent proposals out there now, so I hope they come through. RBJ: How has Tower280 at Midtown been received? What’s the occupancy rate for the building? Is there interest in the first-floor retail space? MORGAN: We’re about 90 percent leased on the residential part. There’s a mix of tenants. There are people from Pittsford, there are people who have moved here from out of state who work in the medical centers, who work for the highest qualified employers in Rochester. And then you have the millennials who have moved in. So you have a mixture of all different types of people living in here. GLAZER: Commercially, the offices are 100 percent leased. And then the retail, there’s Branca (restaurant), and that’s getting close to opening. There is retail (space) on the ground floor, but since the (residential) tenants are in here and the commercial tenants are in, we’re getting a lot more calls. The interest has really taken a step up, and we’re working on several different fronts. Hopefully more announcements will be coming. People who live here are pretty excited. I have a feeling in about a year there will be a waiting list. We filled it so quickly and (did so) before the city has gotten going. And once we get retail here and things get built up around it, this will be the place to be.